Helps correct an overabundance of slow wave activity, commonly found in depressed individuals, in particular, those with seasonal affective disorder (SAD). This is the 3-hour extended version of my original 20-minute SAD product. Those who suffer from depression, in particular, Seasonal Affective Disorder (SAD), are often found to have an overabundance of ‘slow wave' activity in the brain. This slow wave activity is usually in the Theta range of 4Hz to 8Hz. 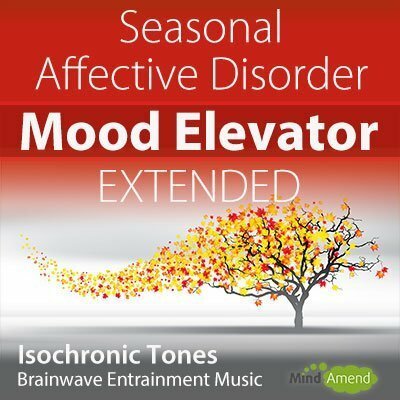 The ‘Mood Elevator for SAD' track uses Isochronic Tones, to speed up your brainwaves into the higher Beta range of 20Hz. This will reduce the ‘slow wave' activity and increase the blood flow in your brain, and help to lift your spirits and increase motivation. The session begins at the 10Hz frequency, then ramps up to 20Hz by the 7-minute mark. It stays at 20Hz until it reaches 16 minutes, where it gradually guides you back down to 15Hz and stays there to the end. Once the session begins, relax and close your eyes. This session can be used with or without headphones.